If you're anything like me, you don't bat an eye at adorning your interior walls with colorful accessories. So why does your fence remain a blank slate? Take advantage of the vertical space your fence provides by enhancing it with potted plants. 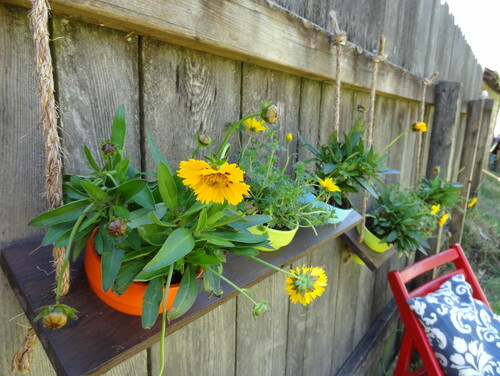 This simple DIY hanging shelf adds visual interest and color to your outdoor space without taking up prime real estate. Not only is this a simple way to add some style to your backyard but it's also incredibly inexpensive. For the full tutorial, jump on over to my Houzz ideabook. I love this! I live in the city and I try to hide my balcony's view of the blah alley with planter boxes. This would be a great alternative with much more color. Thanks Meg! I love these! These would be good hanging on my fence behind the garden and would save me from some tacky garden art. Absolutely awesome! 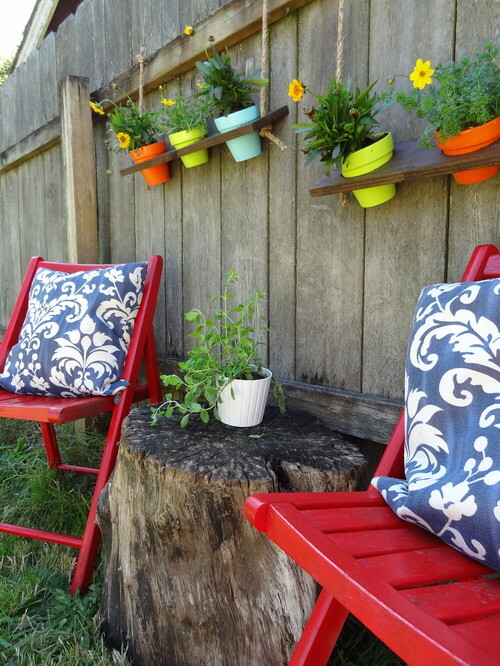 I have tons of blank fence area that could definitely use this kind of freshening up! Thanks everyone! I'm planning on making a few more of these and installing them on more of our fencing. Heck, I like 'em so much I might just hang them in my house. what a bright fun happy space!! i love the bright colors and the seating! this is a great idea for small outdoor spaces. I love this! So bright and cheery! I would love for you to link this up to The CSI Project. The challenge this week is summer outdoor decorating and parties. Come on over and you just might win or be featured!! !